I love the look on this kitty's face. "Where did I leave my keys?" Hannah is a 10-year-old female cat with a lovely grey and buff coat. She is a petite kitty, weighing in at just 6 pounds! Hannah was brought to Lollypop Farm in March, because her owner could no longer care for her. This gentle girl loves attention and gives little love nibbles to show her appreciation. Hannah is looking for a retirement home where she can keep you company while you enjoy a cup of coffee or tea. She is eligible for our Seniors-for-Seniors program, so approved adopters 60 and older can bring Hannah home free of charge! 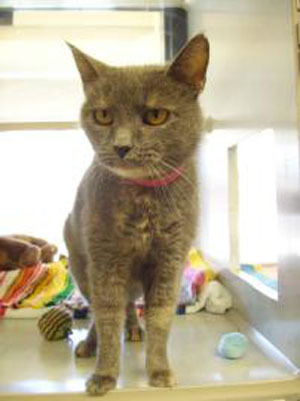 Since Hannah has been waiting patiently for a new home she is one of our Featured Felines: Purrfectly Patient. Now through Friday (5/27), adopt her for just $35, or any other cat, 5 months or older, who has been here 1-month or longer! Hannah will make a purrfect companion! Kaylee, the dog from last week was adopted!